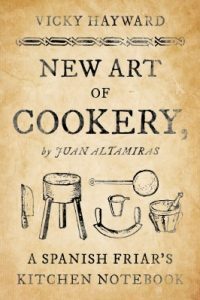 New Art of Cookery, Drawn from the School of Economic Experience, was an influential recipe book published in 1745 by Spanish friary cook Juan Altamiras. In it he wrote up over 200 recipes for meat, poultry, game, salted and fresh fish, vegetables and sweet things in a chatty style aimed at readers who cooked on a modest budget. He showed that economic cookery could be delicious if flavors and aromas were blended with an appreciation for all sorts of ingredients, however humble, and for diverse food cultures, ranging from that of Aragon, his home region, to those of Iberian court and New World kitchens. This first English translation gives guidelines for today’s cooks alongside the original recipes, and weaves a new text portraying 18th-century Spain, its everyday life and food culture between the original recipes. The author, Vicky Hayward, based her contextualisation on extensive historical and archive research. She explores links between New Art’s dishes and modern Spanish cookery, tells the story of her search to identify the book’s author and understand the popularity of his book for over 150 years, and takes travelers, cooks, historians, and students of Spanish language, culture, and gastronomy on a fascinating journey to the world of Altamiras and, most important of all, his kitchen. * 103,000 words: 38,000 words original 18th-century text; 52,000 words new 21st-century text and 15,000 notes and bibliography. * 207 original 18th-century recipes. * 220 new recipes and variations, including 28 recipes by 21 guest cooks.